Imagine a college convening a panel to discuss “Antisemitism and the Struggle for Justice,” that features a woman who seeks the destruction of the Jewish state, and who publicly stands with and supports a Palestinian-Arab terrorist who was convicted of murdering Jewish college students. Moreover, the New School panel’s other panelist/speaker is Rebecca Vilkomerson – the head of the virulent anti-Israel group “Jewish Voices for Peace” (JVP), which is a major promoter of anti-Israel anti-Jewish boycotts. Thus, both panelists on The New School’s purported “anti-Semitism panel” are women who are doing their utmost to destroy the Jewish homeland. Sarour seeks the destruction of the Jewish state and publicly stands with and supports a Palestinian-Arab terrorist who was convicted of murdering Jewish College students. Sarsour’s anti-Israel animus is intertwined with her Islamist supremacism. 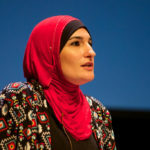 During a recent speech at the Islamic Society of North America a/k/a ISNA (an unindicted co-conspirator in the Holy Land Foundation trial, involved in funneling money to Hamas), Sarsour called on American Muslims to wage “jihad” against President Trump; to not assimilate into American society, but to instead act “to please Allah and only Allah”; and “to be perpetually outraged every single day.” Sarsour used variations of the term “oppressor” at least 14 times during her speech, indicating that the “jihad” she was referring to was of the violent variety permitted against “oppressors” under Islamist interpretations of the Koran. Sarsour appears in photographs (also here) deliberately making the pointed index finger gesture, which is a sign of support for jihad (adopted by ISIS and other radical Islamists). Under Islamist interpretations of sharia (Islamic law) propagated by the Muslim Brotherhood, Hamas, al Qaeda, ISIS and other groups, jihad is the Muslim obligation to utilize all methods, including force and conquest and deception (taqqiya), to extend and perpetuate Muslim dominion over non-Muslims. According to Islamist interpretations of sharia, land once conquered and ruled by Muslims may not thereafter be ruled by non-Muslims. This religious and cultural interpretation is the underlying cause of the continuing Arab/Muslim war against Israel’s existence. Sarsour thus is an outspoken opponent of Jewish self-determination, embodied in the state of Israel. Sarsour unabashedly seeks Israel’s demise in favor of an Arab-dominated state to be built on Israel’s ruins. In her bid to demonize Zionism and cast it beyond the pale, Sarsour made the novel, Stalinist argument that feminists can’t be Zionists: that feminism must exclude anyone who supports Israel. Sarsour ignores the fact that Israel is the only Middle Eastern state to protect women’s rights. Sarsour has sought to conceal her anti-Jewish animus by making a much-publicized bid to raise funds to repair the tombstones when Jewish cemeteries in St Louis and Philadelphia were desecrated. There are conflicting reports as to whether all promised and raised funds were delivered. When I asked St. Louis cemetery officials if Sarsour was in contact with them, they said no. Regardless of this gesture, and regardless of whether or not Sarsour kept substantial portions of the funds raised, it does not change Sarsour’s continuing hatred of Israel, pro-Israel feminists and anyone else who supports the right of the Jewish people to have their own homeland. Indeed, in her hatred of Israel, apparently no one is too repulsive for Sarsour to embrace. Sarsour posed for photographs with a Salah Sarsour, a former operative of Hamas, the US- and EU-designated terrorist organization whose Covenant explains that it is committed to the destruction of Israel and the global murder of every Jew. In April, Sarsour proudly shared a platform at a JVP event with convicted Palestinian-Arab terrorist Rasmea Odeh, a member of designated terrorist organization PLFP (Popular Front for the Liberation of Palestine) who was convicted for murdering two Jewish college students in a 1969 terror attack in Israel, and ordered deported from the U.S. for lying about her conviction on her U.S. immigration forms. Odeh’s bombing attack also maimed nine more innocent Jews. Yet Sarsour stated she was “honored to be on this stage with Rasmea [Odeh].” Likewise, co-panelist Rebecca Vilkomerson’s JVP announced that they were “proud” to host Rasmea Odeh. The notion that someone who makes common cause with Farrakhan – a man who described Judaism as a “gutter religion” and the “synagogue of Satan,” called Israel’s creation an “outlaw act,” called Hitler a “great man,” and blamed Jews for African American economic problems – could possibly be a responsible voice to participate in a panel on anti-Semitism is too absurd to be entertained, except apparently by the New School. Moreover, contrary to the impression she wishes to cultivate as a moderate Muslim female seeking liberality, brotherhood and mutual understanding, Sarsour’s embrace of illiberal, repressive sharia, which also imposes severe disabilities on, and discrimination against women, has made her an implacable of enemy of genuine feminists who are trying to combat Islamist repression of women. Sarsour’s vulgar tweet was particularly hurtful in light of the fact that Ali in her youth was a victim of female genital mutilation, and often speaks out against this FGM, which is still practiced widely in parts of the Muslim world and apparently even in America. Sarsour is also known for making Muslim victimology statements unhinged from reality. For instance, in an interview on national television in 2015, Sarsour bizarrely claimed that Muslim “kids are being executed” in the United States. During the same interview, Sarsour falsely asserted that “anti-sharia bills [are] trying to ban us from practicing our faith” – when in fact, the bills at issue merely prevented American courts from applying any foreign law. Sarsour has shown herself to be partial to bizarre anti-American conspiracy theories. Thus, in May 2012, Sarsour baselessly claimed that an al-Qaeda plot to blow up an airliner by underwear bomber Umar Farouk Abdulmutallab, foiled in a counter-terrorism operation, was actually a “CIA [plot] all along” designed to sow unwarranted fear among the American public. Little wonder that, in 2008, addressing the radical Islamic Society of North America, she urged American Muslims to “watch out for all law enforcement, whether they’re ICE, FBI, local NYPD,” and, thus, implicitly, not to cooperate with the law. The New School claims that by hosting this panel, it has stepped “into a long tradition of combatting antisemitism.” Promoting anti-Semites and their supporters is in fact the negation of any such mission and a disgrace for those who do so. By hosting Sarsour, The New School will be legitimizing Jew-hatred, Muslim supremacism and hostility to genuine fighters for women’s rights. 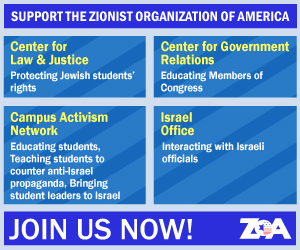 Morton A. Klein is the National President of the Zionist Organization of America (ZOA).